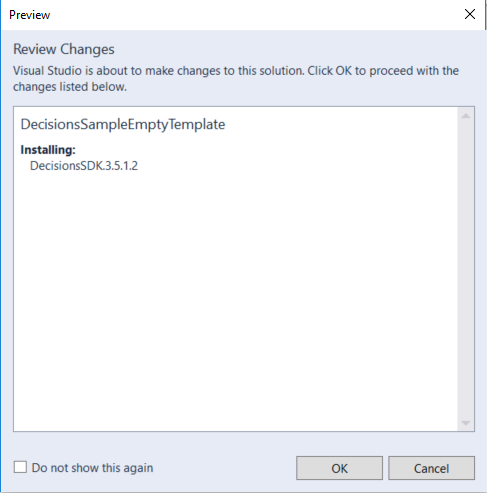 You can install the Decisions SDK as a NuGet package in Visual Studio. Note: the Decisions SDK .msi file is not being updated. Always use the NuGet package to ensure a current version. Once you have opened your solution in Visual Studio, click Tools > NuGet Package Manager > Manage Packages for Solution. 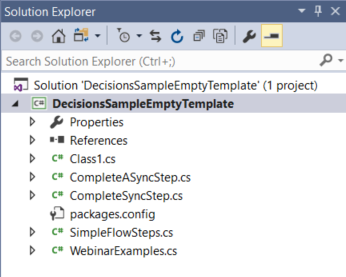 In the NuGet - Solution	panel, click Browse	then search for DecisionsSDK	in the search bar. Click the DecisionsSDK,	then in the right panel select the check box for your solution and click Install. 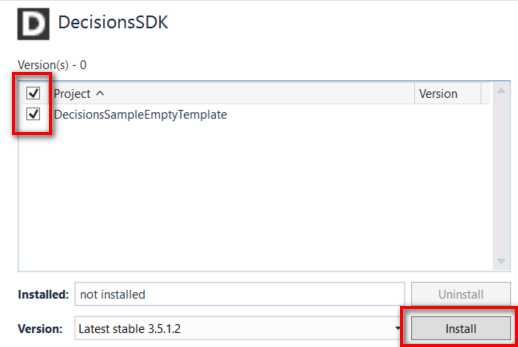 In the Preview	dialog, review the changes and click OK.
Once the SDK installation is complete you will see the changes reflected in the Solution Explorer	panel.